The 100% cotton Tactical Shemagh is traditional desert headwear designed to protect the head and neck from sun, sand or other harsh desert elements. Desert Shemaghs are traditional desert head-wear that are designed to protect the head and neck from sun and sand. Tactical scarves are worn by military personnel worldwide and also as a fashion accessory. The military scarf also makes for a great survival tool and is an easy add to your bug out bag. 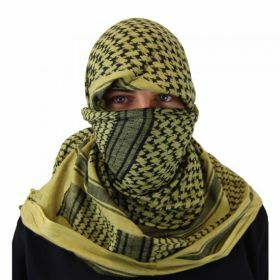 The Shemagh (or Keffiyeh) is an incredible multi-use travel tool. 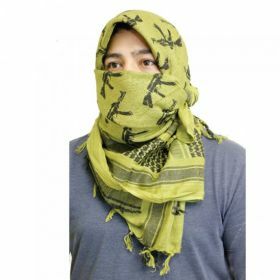 The Shemagh (pronounced “shamay” or “schmog“) is a soft piece of woven cotton cloth, kind of like a giant heavyweight bandana. You can also think of it as a smaller (yet thicker) sarong.